10 pax pulled themselves out of the sack in the pre-Florence gloom to test themselves against our very own mythological beast. Since the leading bands of the hurricane had not yet arrived, the only moisture was covering the pax after 45 minutes of AMRAP is 150% humidity. 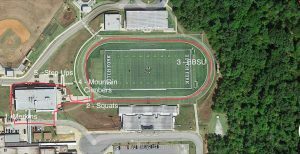 A 5 station AMRAP, starting at the bottom of the stairs, circling the athletic building and the track, finishing at the bottom of the stairs. Each station has an exercise. The 1st lap is 20 reps per station, the 2nd lap is 19, and descending down until time expires. See diagram below for locations of each station. AMRAP until time is called. Mosey back to Shovel Flag at 5 minutes till. Praying for those in the path of Hurricane Florence. Brace yourselves and be ready to look after your neighbors and those who may be in need of help during/after the storm. This is what we do. Let’s be ready.